One of the benefits of this job is the opportunity to track some filmmakers during their careers, to see how far they go. When I was first starting out as a film writer, I had the opportunity to interview the actress Ashley Bell for her superhero indie Sparks in 2013. At the time she’d was in the midst of her IndieGoGo campaign to raise money to film an Asian elephant rescue for a planned documentary. Four years later, Bell is still acting (including last year’s Novitiate) and adds director to her resume with the feature Love & Bananas: An Elephant Story. The film follows the rescue of a 70-year-old blind Asian elephant which has been held in captivity, and is less than two days given her freedom by the conservation team led by Lex Chailert. After speaking with Bell twice on her work as an actress, it was excite to finally talk with her about this clear labor of love. Lesley Coffin: I was just starting out when we spoke in 2014 and the IndieGoGo campaign was in its final week, but you’d already done work on the film before that. How long did this film actually take to get made, from funding to post? Ashley Bell: Human babies take nine months, elephant babies take two years and documentary babies take four to five years. So, I feel like I’ve been working on this project for quite a long time. When I started, I thought I’d be making a documentary short. I heard from a family friend, David Casselman, who owns the Cambodian Wild Life Sanctuary, that they’d found two elephants available for rescue. It took them 10 years to find these elephants. And when I got that email something came over me and I knew I had to film this. And I pitched the idea to a production company called Change for Balance and within two weeks we were filming. And I thought I was filming a happily ever after story, but it turned out to be an absolute disaster. The forest was being illegally logged and poached. The elephants were in horrendous condition because they were being released from a logging facility. They were covered in scars, dehydrated and malnourished. We were briefly surrounded by the Cambodian military and there were unidentified explosives being detonated. And to see the state of that with my own eyes was devastating, but having seen the footage our conservationist Lek Chailert took of the elephant rescue was the most victorious, electric footage I’ve seen. And I asked if I could come, and when we got back to the states the footage we had to assemble wasn’t a short, it was a feature. That short film idea I had wasn’t the story that needed to be told, we needed to shift gears and film the entire elephant rescue. I was very vocal about doing this documentary from the very beginning because this is a cause I’m passionate about, and it’s about more than my documentary. I wanted to use whatever films I happened to be promoting as an actress to shine a light on this cause. It took us two and half years to find an elephant to rescue and during that time we did an IndieGoGo campaign which is what I’d been raising money for when we first spoke. Lesley Coffin: You clearly always had the confidence to speak about the causes you were supporting, and you’ve clearly been doing that since early in your acting career. Do you feel celebrity comes with obligations to discuss causes you feel strongly about? Ashley Bell: I was born and raised a vegetarian and always taught to be very eco-aware. So it’s been a major part of my daily life since before I can remember. It’s just who I am. So talking about these ideas in public and with the press, it felt completely logical and organic. It was never a cautious choice career wise to talk about it, this cause feels more like a vocation to me. Having seen, briefly during filming, the struggles these species are up against, I just had to get the word out. And because I have access to the media, it felt like an obligation. It was a small way to do my part. I understand how people can feel overwhelmed, especially animal rights and environmental causes, like they’re being asked to save everything. But that’s really not where we’re at, it’s about asking ourselves the one part each person can do for a cause? This was something I had the resources and ability to do. And I’ve also always wanted to direct. I studied directing at Cambridge and NYU, but I always thought I’d try my hand at narrative films. And I thought I’d step into those shoes at a much later point in my life. But the call to tell this story just happened and from inception I knew I needed to be the one to tell it. Lesley Coffin: The fact that the movie had to be made when an elephant became available means you had to do all your pre-production in advance but then put it on indefinite hold. Were there times when the lack of awareness of when you’d actually be able to film put that pre-production work at risk of falling through? Keeping equipment and crews on hold has to be a risky move. Ashley Bell: We got the message on Facebook that there was an elephant for rescue two days before flying out, so we didn’t have a lot of warning for sure. Regarding our crew, we had partnered with Change for Balance and they helped us get a crew, three guys and me. One guy was doing our sound and taking behind the scenes photography and holding a wide angle lens. And because we had such a barebones crew we were able to move very fast. And having that size of a crew meant we weren’t going to overwhelm the elephants. Even during pre-production, seeing the footage of that first rescue in Cambodia, you see that these severally abused elephants have been traumatized and you can’t overwhelm them with a lot of people and machinery. If you crowd around them they get physically distressed, so we had to be very cautious that we are always on their turf. You have to respect that you are sharing space in this new home where they’re finally free. So we had two and half years to prepare and I’m a very impatient person. And I was kind of scheming and looking at different ways to tell the story faster, so we could get the message out there. I think I white boarded about 18 different ways to tell this story. But then I realized, this is about showing an elephant rescue from start to finish. And we have to stay with that vision, even if it takes years to find one to rescue. In the two and half years we did a lot of our research and tracked down as much footage as possible. Lesley Coffin: Was there a point where you felt pressure to make one of those films which didn’t focus on one elephant rescue? 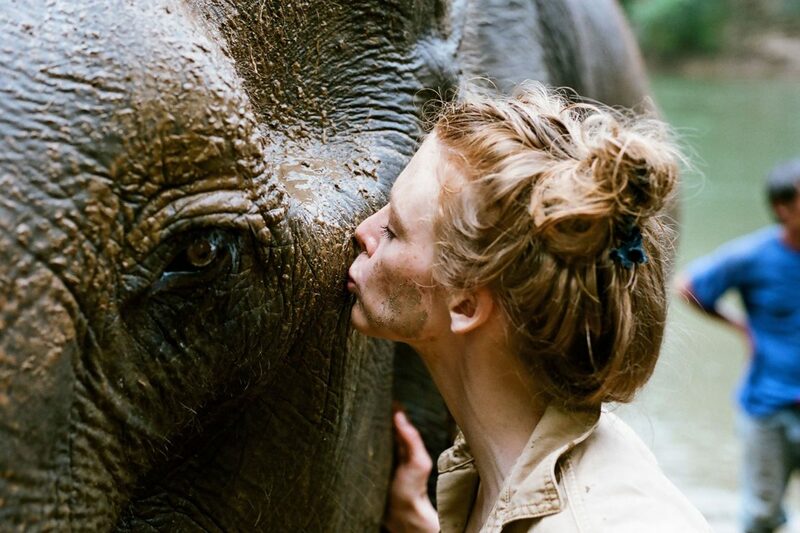 Ashley Bell: We had two producers on board and day one I said, “I want to tell people about going on an elephant rescue.” And they said, “Well that’s the B story. What’s you’re A story?” And I said, “No that’s the film.” And they were asking, “well who’s the main character, who are you focusing on?” And I said, “the elephant’s the star, it’s her story”. And one of them asked “but how do you know which is the right elephant to make a movie about.” And I was just baffled and said “the right elephant? There isn’t a right elephant, one elephant equals all elephants.” And we just kept going back and forth about this, they asked “should we wait to film until we have the right elephant” and I said “these guys are going be gone before we find your perfect elephant!” If we get an elephant to rescue, that’s fate giving us the right elephant. And having to defend that vision actually helped me stayed determined to tell the right story. And I partnered with this amazing writer Fernanda Rossi. And she made it very clear that she wasn’t there to change the story, she’s there to help my footage tell the story. She referred to herself as being “like a midwife, she’s there to help me give birth to my film.” And we were going to do interviews, but the strongest things to come through was the idea of capturing a completely on the fly rescue. And because we were filming the entire time, we had enough footage to build a feature film around that rescue. And because we took that approach, we never wanted the film to feel like something preachy or staged. This was about being authentic and making a film which would appeal to the youth who can so easily sniff out when a situation is forced or fake. Lesley Coffin: Because this film was made in tandem with this larger cause, what next step do you hope viewers take? Ashley Bell: As Lex Taylor says, the key to saving these animals is education. I hope that people leave with a truer awareness of elephants. But I also hope people have a better understanding of how we share this planet with animals. Every time there’s a new iPhone on the market, we update everything. But we haven’t updated our views of animals. Too often, we don’t think of the animals we don’t see every day or live close to. But our behavior’s still having a very direct impact on their lives. People have asked me why this matters to us, what elephants do for us. And I explain they’re keystone species. Their existence provides habitats for other animals. They migrate and create paths through the jungle. Their waste leads to the growth of trees and berries. They repopulate plants and their bodied provide food and shelter for other animals. If a species like that goes away, we don’t know the repercussions, but a vacuum of that size will be huge. There are 400,000 African elephants left in the world. There are 45 Asian elephants left in captivity. In parts of China there are only 30. They are functionally extinct because they can’t breed within their tribe. And I hope this will encourage others, especially women and girls, not to give up. If they have an idea, tell their stories. I actually had been taking notes on the process over five years and put out an eBook I’ll be releasing called Shoot It, Sell It, Show It: How I Made an Indie with Grit and Google. I wanted to tell it all to encourage first time filmmakers. Read FF2 Media's review of Love and Bananas HERE.